Retailers listen as the Senate Finance Committee debates SB 597 which would close the Amazon tax loophole. Retailers traveled from across the Commonwealth and included Virginia Retail Federation (VRF) members from Richmond and Hampton Roads as well as other areas. Richmond, VA – Legislation to close the ‘Amazon loophole’ in Virginia unanimously passed the Senate Finance Committee on Tuesday, February 7th. Senate Bill 597, sponsored by Senator Frank Wagner (R-Virginia Beach), says that online retailers that operate warehouse or distribution centers in Virginia cannot use tax complex corporate structures to avoid collecting and remitting the state sales tax. “The legislation will create a more level playing field for Virginia retailers,” said Senator Wagner. “Companies with a physical presence in the state should all play by the same rules,” he said. Senator Frank Wagner, the patron of SB 597, passionately testifies about the merits of his bill in front of the Senate Finance Committee. The VRF thanks the Senator for his efforts on this issue. Current Virginia law says that companies, including their subsidiaries, that operate warehouse or distribution centers are required to collect and remit the state sales tax. Amazon.com is the only known retailer in Virginia that has created a separate distribution subsidiary for the presumed purpose of avoiding the sales tax obligation. When Amazon or other retailers do not collect and remit the sales tax, consumers are legally obligated to remit the use tax on their annual state income tax filing. 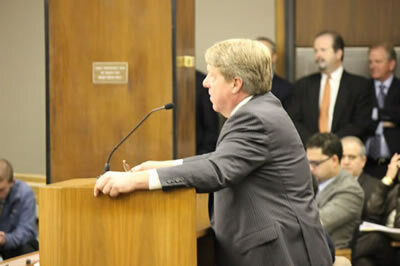 Retailers stand in support of SB 597 during the Senate Finance Committee meeting. SB 597 would close the Amazon tax loophole and level the playing field for retailers in the Commonwealth. Amazon maintains distribution centers in about 13 states. They currently operate one in Northern Virginia and will operate two additional centers in central Virginia in the near future. Amazon has entered into voluntary agreements with four states – California, South Carolina, Indiana and Tennessee – to collect the tax as early as this September 1. Pennsylvania is also requiring online retailers with a physical presence to collect and remit the sales tax by September 1 of this year. Other states including Arizona and Texas have assessed Amazon notices of delinquent taxes stemming from similar corporate structures. They acknowledge physical presence in Washington State. Legislation is also pending in several other states. Senator Emmett Hanger speaks in favor of Amazon loophole closure during the Senate Finance Committee meeting on February 7. In years past Senator Hanger has carried bills to address the unfair tax advantage that internet corporations enjoy. “States are moving quickly to address this loophole,” said Shinn. 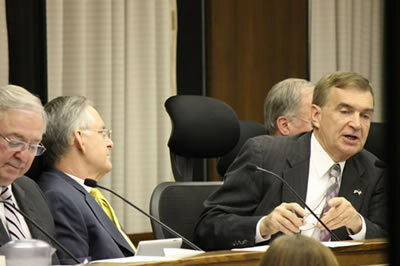 “If the issue plays out in Virginia similarly to how it has in other states, the state can get both the jobs and the uncollected tax revenue.” The official legislative Fiscal Impact Statement has determined that Virginia could recognize $24 million in uncollected tax revenue on an annual basis if the bill passes. The Virginia Retail Federation is an important member of the Alliance for Main Street Fairness (AMSF) in Virginia which is a coalition of retail companies and organizations dedicated to promoting the fair taxation of retail goods in the Commonwealth. The Virginia Retail Federation, Retail Alliance’s statewide advocacy arm, garnered a big win for most of its member in Governor Bob McDonnell’s proposed 2012-2014 budget. Due to the VRF’s heavy lobbying on elimination of the Accelerated Sales Tax (AST), the threshold for retailers eliminated from paying the tax is lifted from $5.4 million and under in taxable sales to $26 million and under in sales and/or purchases in the previous year. In his press release on the issue, Governor McDonnell quoted George Peyton and Margaret Ballard, VRF government affairs specialists. The VRF will work with Governor McDonnell and his staff to pass this section of the budget and will continue to advocate for total elimination of the unfair Accelerated Sales Tax. RICHMOND – Governor Bob McDonnell will use the Caboose Budget Bill to rapidly speed up the phase out of the accelerated sales tax policy in the Commonwealth. With the Governor’s action, by the end of Fiscal Year 2012 95.6% of affected sales tax dealers will no longer have to make accelerated payments to the state. The Governor will include $50 million to facilitate this policy change. The Governor had earlier sought to begin unwinding the accelerated sales tax beginning in FY2013. With today’s action, the governor has sped up the process substantially. To eliminate the accelerated sales tax further, the Governor is asking the General Assembly to appropriate $50 million in the biennial budget to allow for the elimination of the accelerated sales tax requirement for 1,407 more retailers. In fiscal year 2010, which began on July 1, 2009, at the height of the Great Recession, the General Assembly required certain merchants to pre-pay a portion of their July 2010 sales tax remittance in June. This policy change, commonly known as the accelerated sales tax payment, applied to all dealers with $1 million or more in taxable sales and/or purchases in the previous year and was equal to 90% of their retail sales and use tax liability paid in June of the previous year. In the 2011 Session, the General Assembly reversed part of this policy change by raising the $1 million or more taxable sales and/or purchases threshold to a level of $5.4 million or greater in the previous year. This change relieved 7,026 dealers from the accelerated sales tax requirement and decreased revenues by $45.7 million. The Governor’s proposal recommends that the threshold for dealers to be subject to the payment be raised in June 2012. The new threshold level will be $26 million in sales and/or purchases in the previous year. This proposal is built into the Caboose Budget Bill and will exempt another 1,407 dealers from making accelerated sales tax payments next June. Fiscal year 2012 general fund revenues have been reduced by $50 million to account for this provision. The 2013 General Assembly was a 46-day-long whirlwind which saw both perennial bills being introduced and a finale that featured a landmark Transportation funding package that will be a highlight in Governor McDonnell's legacy. The VRF Lobbying Team focused on transportation and maintaining the Dealer Discount analysis language in the budget during the General Assembly Session. The Senate and House Transportation Conferees reached a deal halfway through the final week with regard to solving the Commonwealth's transportation struggles. Once the Conferees reached an agreement, the bill had to pass out of both the House and the Senate. On Friday, the bill passed out of the house by a 60 to 40 vote. The Senate heard the bill on Saturday and the bill passed out of the Senate on a 25 to 15 vote. The bill has now been sent to Governor McDonnell for review. The portion of the bill that will affect all retailers is the statewide increase in the sales tax from 5% to 5.3%. The .3% increase in sales tax will also cause the processing fees and operating costs to retailers on credit and debit card transactions to go up. However, the .3% is less burdensome than the originally proposed .8% increase. In addition to the .3% statewide increase, there is a .7% increase in sales tax for both the Hampton Roads and Northern Virginia regions. This brings the sales tax in those regions to 6%. The VRF joined a Coalition seeking an analysis of the true cost to retailers with regard to being the sales tax collector for the Commonwealth. In order to have this considered by the Virginia General Assembly, we had language put into the budget that explained the need for this analysis and would determine the cost of reinstating the Dealer Discount. This language was taken out of the House budget in early February. However, it remained in the Senate budget when it went to conference. The VRF and the Coalition for this issue met with the Budget Conferees individually to explain the importance of this analysis to our members. Unfortunately, when both the House and the Senate adopted the full budget the language was no longer in there. However, we will continue to work on this issue and hopefully be able to get this done in the 2014 General Assembly Session. Below is a list of issues that we have continued to report on throughout the 2013 General Assembly Session. These are a few of the most important pieces of legislation introduced this year that could have an impact on our members. As we have reported over the last several weeks, bills are introduced annually which attempt to repeal the post Labor Day statute. This year is no exception. The VRF continues to maintain their position that the current school calendar laws should remain in place. There is a new study that was conducted by the University of Minnesota that has been valuable tool in our efforts to fight this legislation. The study shows the negative economic impact, to the tourism and retail industries, of opening schools prior to Labor Day. The House bills on this issue were passed out of the House, as they were the previous year. This meant that we had to lobby the members of the Senate Education Committee with regard to the School Calendar bills. At the Committee meeting, testimony was heard on both sides of the issue. After the Committee members heard all testimony, they voted on the issue and killed the bill. We know that the School Calendar/Post-Labor Day start date issue will be raised again next year, and we will continue to work to make sure that the laws on the books remain the same. Legislation was introduced and passed out of the Senate that would allow Henrico and Chesterfield Counties to by-pass the citizen referendum and levy a meals tax if they have a unanimous vote from their respective Boards of Supervisors. The legislation would permit Henrico County and Chesterfield County to levy a 4% meals tax. The 4% meal tax would apply to all purchases made at restaurants, all hot prepared foods sold by grocery stores and convenience stores, and it would also apply to hotels that have restaurant and banquet areas. In addition, if the legislation had passed, caterers would also have to charge the 4% meal tax on all events. The bill was heard by the House Finance Subcommittee #3 where proponents and opponents of the legislation presented their arguments to the Subcommittee members. After testimony was taken, there was a unanimous vote to place the bill on the table. This means that the Subcommittee killed the bill. Since session has ended, Henrico and Chesterfield County officials have begun talks to bring the meals tax to a referendum vote. It has been expressed by county officials that if they don't have the meals tax revenue they will be forced to raise the real estate tax. For home owners, the real estate tax is a tax deduction from their income tax, however, a meals tax is not. Everyone should calculate what a 2 or 3% increase in their real estate tax amounts to and compare that to the amount they pay for meals eaten out or for hot prepared foods purchased at grocery and convenience stores, if a 4% meals tax were added to those purchases. Both the House and the Senate passed legislation that requires a pawn broker to scan the photo ID used by individuals who pawn items or sell items to pawn brokers. In addition, at the end of each business day the pawn broker must electronically submit a picture of the ID to law enforcement in their jurisdiction. A second provision of the bill prohibits a pawn broker from taking in an item for pawn or purchasing an item when the serial number has been altered, defaced or removed. These two requirements are the result of a compromise between the pawn brokers and law enforcement officials. The original bill, introduced in the 2012 Session, would have required a picture of each item pawned or sold to a pawn broker. This legislation was unanimously passed by the House and Senate, and now it will make its way to the Governor's desk. Every year there are several bills introduced that attempt to either impose a fee/tax on using plastic bags or to ban plastic bags altogether, and every year the Virginia Retail Federation opposes this type of legislation. Rather than a ban/fee on plastic bags, the VRF advocates for recycling programs to be established throughout the Commonwealth. This year, there were three bills introduced seeking to impose a fee or a ban on plastic bags. We worked to make sure that all three bills were not passed out of subcommittee. A bill was introduced in the House that would require employers, including the Commonwealth and localities, to excuse an employee from employment for each day the employee's service as a juror exceeds three hours. The requirement would apply when an employee is summoned for jury duty in a federal or state court and provides his immediate supervisor, on the next working day after receiving the summons, with the original or a photocopy of the summons. With certain exceptions, the employee is entitled to his usual compensation for periods he is excused, though the employer may deduct any compensation the employee receives for the jury service. Employers may not discharge or discriminate against an employee for jury duty if the required notice is given. An employee who is discharged, demoted, or suspended in violation of these provisions may seek reinstatement and reimbursement for lost wages and benefits and recovery of attorney fees and court costs. This bill was assigned to the House Commerce and Labor Committee and failed to make it out of committee. A bill was introduced to abolish the 10% tax on the distributor of tobacco products and the method of calculating tax on loose-leaf tobacco based on its net weight, and to establish a 5% tax on tobacco products at the retail sales level. In addition, the bill requires the licensure of retail dealers of tobacco products. Retail dealers must pay a $30 license fee annually and report the 5% tax to the Department of Taxation monthly. Due to the licensure requirement, the VRF worked to get this bill killed in the House. A bill was introduced in the House that would require a retail establishment, with an "Employees Only" restroom, to allow customers with certain medical conditions to have access to that restroom. Specifically, the legislation addressed customers who suffer from Crohn's disease, ulcerative colitis, or other medical conditions that require immediate access to a toilet facility. The measure would not apply to certain filling stations or service stations or to banks or savings institutions. Had the legislation passed, the operator of a retail establishment who violates this requirement would be subject to a civil penalty. The VRF's opposition to this bill is based on the serious security and liability issues that our members would face should this bill pass. We understand the reasons behind the bill, but there was no way to overcome the legal liability and safety/security problems that this bill could potentially produce for our members. Based on these issues, the bill failed to make it out of committee. The elimination of BPOL has been an initiative that the VRF has worked towards for many years. Over the past year, we have supported a study by the Thomas Jefferson Institute on how to eliminate the BPOL, Machinery and Tool, and Merchants' Capital Taxes while making sure localities remain whole. Based on this study, House Joint Resolution 755 was created in order to determine how the Commonwealth might accomplish our goal. HJ755 directs the Small Business Commission and the Manufacturing Development Commission to assess the study and develop a plan that accomplishes the goal of our study. The resolution was passed out of the House, and was assigned to the Senate Rules Committee. The Committee came to the decision that they cannot direct non-legislative commissions to take action as the Joint Resolution said. However, the Committee Chairman stated that he will write a letter requesting these Commissions to do what the Joint Resolution stated. We will update you on the status of this issue over the next several months. A bill was introduced that requires that retail sales and hotel taxes on transient room rentals to be computed based upon the total charges or the total price paid for the use or possession of the room. The legislation applies to cases in which a hotel or similar establishment contracts with an intermediary to facilitate the sale of the room and the intermediary charges the customer for the room and such facilitation efforts. Under these circumstances, the bill requires the intermediary to separately state the taxes on the bill or invoice provided to the customer and to collect the taxes based upon the total charges or the total price paid for the use or possession of the room. The bill made it out of the Senate and was heard in Committee in the House. Unfortunately, the bill was killed in Committee in the House. However, this piece of legislation will most likely be reintroduced in the next General Assembly Session. Senate Bill 1327 provides that no retail off-premises wine and beer licensee shall sell any alcoholic beverage by means of a self-scanning cash register or other point-of-sale system. The bill defines "point-of-sale system" and provides that any person convicted of a violation is guilty of a Class 1 misdemeanor. The bill seeks to prevent the sale of alcohol to underage customers, however, there is no evidence of current problems with this. Virginia ABC has never received a single formal complaint regarding an ABC violation related to the use of self-scanning checkout. Grocers and retailers have spent millions of dollars in the installation of these systems across Virginia to improve customer convenience; this legislation places those substantial investments in jeopardy. In addition, self-scanning checkout is extremely popular, and limiting its use without any evidence of a problem is anti-consumer. This bill died on the Senate floor on a 19-21 vote. Legislation passed that provides that any person selling alcoholic beverages to an individual shall require the individual to present a photo identification form issued by a governmental agency that contains the individual's complete name, height, weight, and date of birth indicating that the individual is 21 years of age or older or which bears a photograph that reasonably appears to match the appearance of the purchaser. A student identification card shall not constitute bona fide evidence of legal age for purposes of this subsection. Legislation was introduced that attempted to make it an unfair discriminatory practice for an employer to require a potential new employee to have a specific employment status when applying for a job. This could potentially open our members up to countless discrimination claims from unemployed individuals who apply for a job and are not hired. The individual could claim that they were discriminated against based on the fact that they were currently unemployed. We addressed these issues when the bill came before sub-committee, and the bill was easily killed. Legislation passed that provides a penalty for any person other than an authorized holder who possesses, with intent to distribute, more than 5,000 (25 cartons) but fewer than 100,000 (500 cartons) tax-paid cigarettes is guilty of a Class 1 misdemeanor for a first offense and is guilty of a Class 6 felony for any second or subsequent offense. Any person other than an authorized holder who possesses, with intent to distribute, 100,000 (500 cartons) or more tax-paid cigarettes is guilty of a Class 6 felony for a first offense and is guilty of a Class 5 felony for a second or subsequent offense. Additionally, any person who violates the provisions of this section shall be assessed a civil penalty of (i) $2.50 per pack, but no more than $5,000, for a first offense; (ii) $5 per pack, but no more than $10,000, for a second such offense committed within a 36-month period; and (iii) $10 per pack, but no more than $50,000, for a third or subsequent such offense committed within a 36-month period. The civil penalties shall be assessed and collected by the Department as other taxes are collected. Legislation passed that will add gas-powered chainsaws with a selling price of $350 or less and chainsaw accessories to the list of equipment eligible for the sales and use tax exemption for hurricane preparedness equipment. 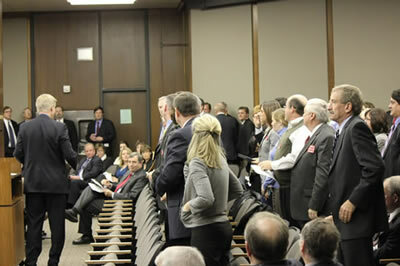 On May 25, 2011 Governor Bob McDonnell invited Retail Alliance to the House Bill 1587 signing ceremony. 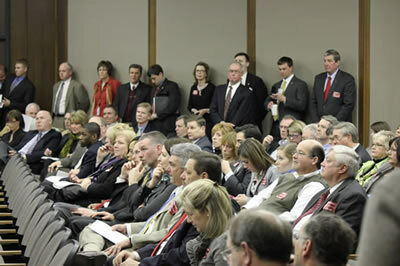 The Virginia Retail Federation, the Alliance’s statewide lobbying arm, was the lead advocate for three successful bills to reform the Business Professional Occupational License tax, BPOL. House Bill 1587 would allow cities and counties to rebate or exempt the current BPOL tax for new businesses during their first two years of operation. House Bill 1437 and Senate Bill 1408 give municipalities the options of charging BPOL taxes based on income - rather than gross receipts - or to rebate the tax if the business losses money during a given taxable year. Virginia Beach and Chesapeake plan to implement the exemption for start-up businesses right away.